Wow! These last three weeks passed by super quickly! While the first two weeks were focused on seed cleaning, seed counting, and x-raying, we spent this past week on our independent projects. But that’s not to say this week was easy! In the past 5 days, I wrote exactly 900 lines of code in R to generate the figures and perform the analyses. 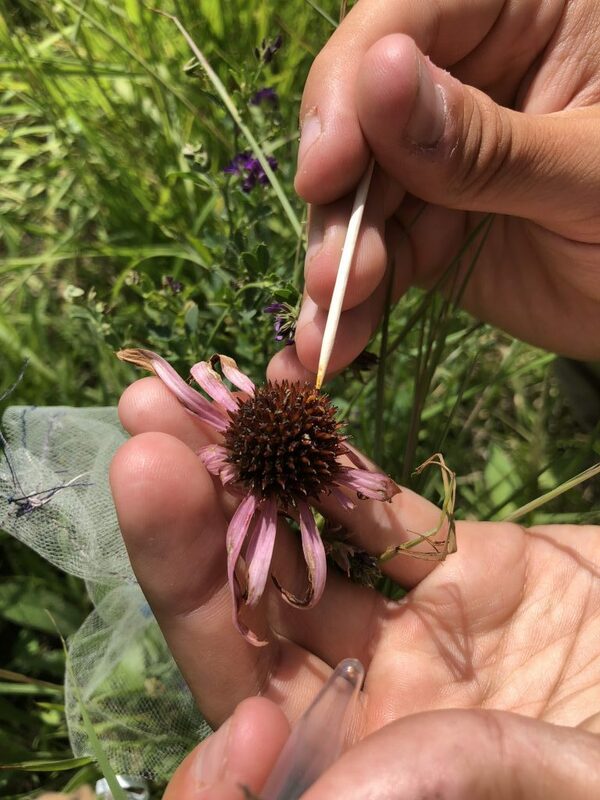 To get at how current pollen limitation affects Echinacea growth and future fitness, I performed analyses testing differences in plant traits between pollen exclusion, pollen addition, and open pollination treatments. 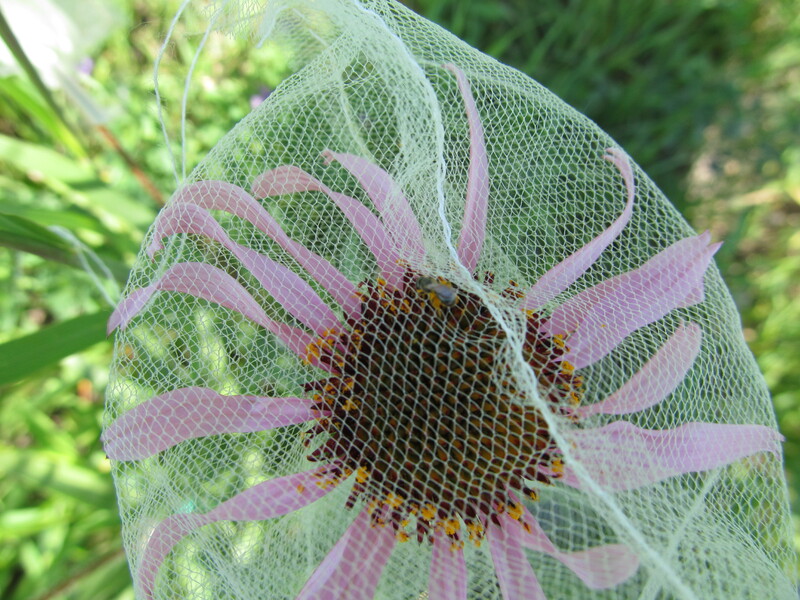 I did not find evidence that pollination treatment affected either growth or fitness, which indicates that current pollen limitation will not benefit Echinacea in the future. This could be because Echinacea is not resource limited or because the cost of seed production is negligible. 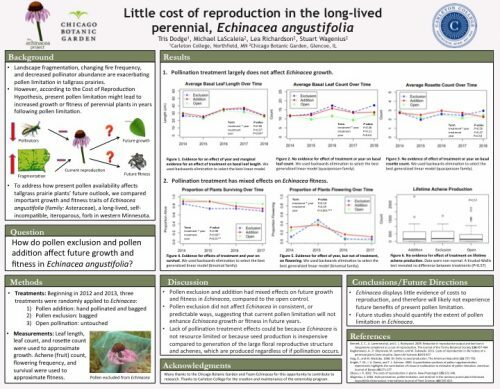 Many thanks to the members of Team Echinacea who helped guide me through this process and made working in the lab such a pleasure! 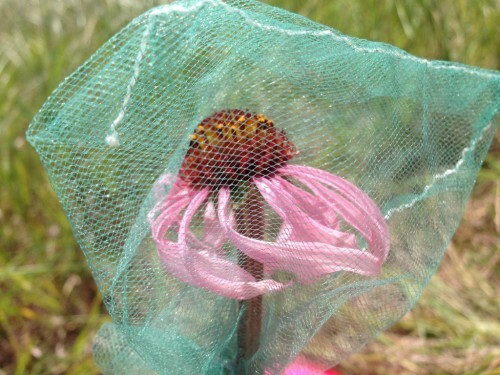 Echinacea head with pollinator exclusion bag. Does receiving the maximum amount of pollination vs. no pollen at all affect a plant’s longevity or likelihood of flowering in subsequent years? We are trying to find out in this long-term experiment, but flowering rates have been so low in the past few years we are not learning much. This summer, only three plants flowered of the 27 plants remaining in the pollen addition and exclusion experiment. We continued experimental treatments on these flowering plants and recorded fitness characteristics of all plants in the experiment. Of the original 38 plants in this experiment, 13 of the exclusion plants and 14 of the pollen addition plants are still alive. In this experiment we assess the long-term effects of pollen addition and exclusion on plant fitness. In 2012 and 2013 we identified flowering E. angustifolia plants in experimental plot 1 and randomly assigned one of two treatments to each: pollen addition or pollen exclusion. When plants flower in subsequent years they receive the same treatment they were originally assigned. Because flowering rates have been so low in 2016 & 2017, differences in flowering due to treatment are not detectable. Physical specimens: We harvested three flowering heads from this experiment that will be processed with the rest of the experimental plot 1 heads to determine achene count and proportion of full achenes. Data collected: We recorded data electronically as part of the overall assessment of plant fitness in experimental plot 1. We recorded dates of bagging heads and pollen addition on paper datasheets. Does receiving the maximum amount of pollination vs. no pollen at all affect a plant’s longevity or likelihood of flowering in subsequent years? In this experiment we assess the long-term effects of pollen addition and exclusion on plant fitness. In 2012 and 2013 we identified flowering E. angustifolia plants in experimental plot 1 and randomly assigned one of two treatments to each: pollen addition or pollen exclusion. 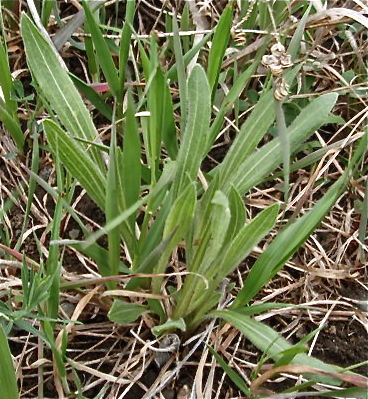 When plants flower in subsequent years they receive the same treatment they were originally assigned. Across all experiments, 2016 was a low flowering year. Only four plants flowered of the 29 plants remaining in the pollen addition and exclusion experiment. We continued experimental treatments on these plants and recorded fitness characteristics. Physical specimens: We harvested four flowering heads from this experiment that will be processed with the rest of the experimental plot 1 heads to determine achene count and proportion of full achenes. The labels for these heads, beginning with the letter “p,” identify them as part of the pollen addition and exclusion experiment.